Stretched along the banks of the Yarra River in Melbourne, Australia, is one of the country’s premier event spaces. Affectionately known by locals as ‘Jeff’s Shed’ (after former Victorian premier Jeff Kennet, who initiated its construction) the building’s distinctive blade-shaped opening welcomes guests to one of the most remarkable and versatile events spaces in the world. When it comes to large-scale exhibitions, Melbourne has the rest of the Southern Hemisphere beat; the Melbourne Convention and Exhibition Centre (MCEC) boasts the largest exhibition space south of the equator, allowing organisers to host events on a truly international scale. MCEC is home to 30,000sq m of clean, pillar-free floor space, as well as a number of large event rooms capable of hosting gala dinners. The centre’s balconied theatre, the Plenary, can seat more than 5,000 people, and has played host to some of the world’s most exciting speakers and performers, such as Neil Young, Sir David Attenborough and the St Petersburg Ballet. The space can also be split into three smaller areas, and each of the centre’s rooms are equipped with the latest technology. MCEC also employs a team of technicians to remain onsite, ensuring each event runs smoothly. With a huge number of spaces available in any size, there are few other conference centres offering so much variety. 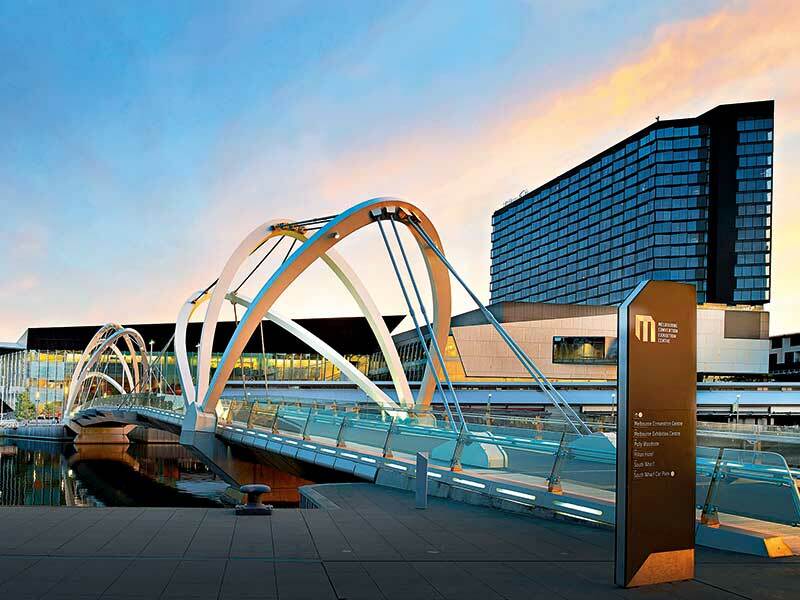 Further, MCEC is located close to a range of fantastic hotels, many with stunning views overlooking the Yarra and the Melbourne Central Business District (CBD). The centre is set to become even more impressive in the years to come, with a major extension already underway. An additional 9,000sq m of floor space will be available from July 2018, with supplementary halls, meeting rooms and stages extending the total size of the venue to more than 70,000sq m.
Outside the conference room, Melbourne offers a wealth of activities perfect for unwinding once the day’s meetings have come to an end. Just a short walk from MCEC, the CBD is home to the city’s famous lanes and alleyways, which are adorned with colourful street art and house a number of hidden cafés. Melbourne is extremely proud of its arts and culture scene, with a huge number of galleries and concert venues dotted around the city. Further, a short tram ride south will take you to St Kilda’s picturesque beaches, while heading east will lead you to the Royal Botanic Gardens. Melbourne is also a prominent feature on the international sporting calendar, and is home to the Australian Football League Grand Final. The Australian Open is the first tennis grand slam of the year, while the Boxing Day Test is a traditional leg of the Ashes cricket series. The city has also hosted the Australian round of the Formula 1 World Championship since 1996, and the Melbourne Cup horserace, nicknamed ‘the race that stops a nation’, is even a public holiday in Victoria. For those wanting to explore beyond the Victorian capital, the breathtaking Great Ocean Road, the Yarra Valley wine region and a number of golden beaches are just a short drive away. With such a vibrant city and no shortage of experiences on offer, it is no surprise Melbourne has cemented its place as Australia’s premier event destination.